Posted on May 15, 2013 by Susan H.
Growing up, Lemon Bread was another one of my favourite desserts my mother would bake for my brother and I. Up until now…I have tried to adapt her recipe to re-create this lemony treat to no avail. 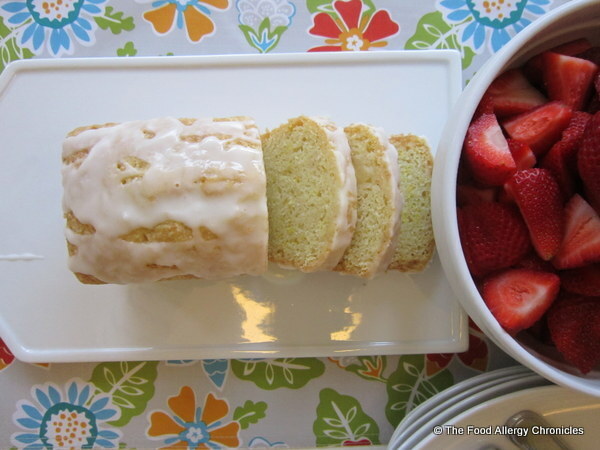 I haven’t enjoyed a slice of Lemon Bread in years…my eldest son has a dairy and egg allergy…I really, really could not get Lemon Bread off my mind. I was determined to figure this one out for Mother’s Day. I decided to take my own advice…I listened to the words I repeat to my boys over and over again…”Use what you know to figure out that which you do not know.”…and by jove, it worked! I know Michael loves my Dairy, Egg, Soy and Peanut/Tree Nut Free Vanilla Cupcakes…(click here for my original post) so, I just added the zest from a lemon to the batter…brushed it with a lemon sugar glaze while still warm from the oven…then drizzled it with a lemon icing. A decadent lemony treat…topped with a lemon sugar glaze and lemon icing! The boys were ‘head over heels’ in love with this recipe…all the adults loved it too. My mother-in-law even had a second piece…so I sent her home with her very own loaf! Add enough icing sugar to leftover lemon juice to form an icing to drizzle over the top. 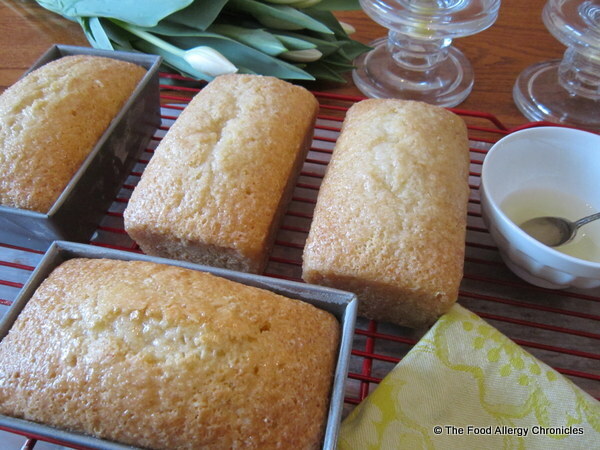 Spray 2 mini loaf pans with canola oil and dust with unbleached all -purpose flour. In a large bowl, measure all the dry ingredients, including the lemon zest. In another bowl, measure all the wet ingredients. Divide batter evenly between the 2 mini loaf pans. Bake 375 F for 30-35 minutes or until tester comes out clean in centre of the loaf. Poke holes in loaves while still in their pans and brush some of the sugar glaze over top of the 2 loaves. Let cool for 10 minutes. Remove loaves from pans on to cooling rack and brush remaining sugar glaze over the 2 loaves. Let cool completely. Once cooled, drizzle lemon icing over the top of each loaf. 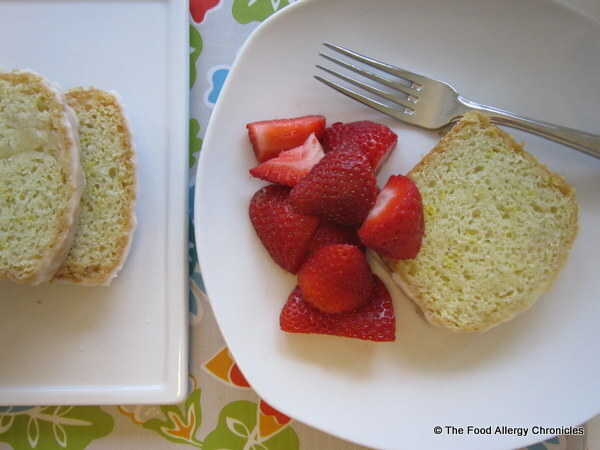 The combination of a slice of Dairy, Egg, Soy and Peanut/Tree Nut Free Lemon Bread with a side of fresh strawberries…heavenly! Just like my mom used to bake…priceless! Comforting childhood favourite food memories is what I hope to incorporate in my boys’ lives…despite their food allergies. Re-creating my childhood favourites has become my obsession. I am slowly baking my way through them…I have yet to tackle cheesecake, lemon meringue pie and coffee cake…and yet to share my adapted recipe for Dairy, Egg, Soy and Peanut/Tree Nut Free Butter Tarts. P.S. For Dairy, Egg, Soy and Peanut/Tree Nut Free Lemon Cupcakes…fill 12 paper-lined or silicone lined muffin tins with batter and bake 20-25 minutes…poke holes in the tops of the cupcakes and brush with Sugar Glaze, when cooled, drizzle with Lemon Icing. Dairy, Egg, Soy and Peanut/Tree Nut Free Mini Lemon Cupcakes take 12 minutes…follow directions as above for the sugar Glaze and Lemon Icing. P.P.S. To keep the loaves fresh…I like to wrap my loaves in wax paper then in foil. Sliced Dairy, Egg, Soy and Peanut/Tree Nut Free Lemon Bread could be sliced and frozen for another time…if there is any left! This entry was posted in allergies, baking, breads, dairy free, dessert, egg free, multiple food allergies, peanut/tree nut free, Snacks, soy free and tagged Dairy Egg Soy and Peanut/Tree Nut Free Mini Lemon Bread, Natur-a Rice Beverage, Natur-a Soy Beverage by Susan H.. Bookmark the permalink. Congratulations on your lemon loaf success!! I will be baking one of my childhood favorites today. My mom dug up the recipe after years of not baking it. It is a really heavy German pound cake from her childhood. She stopped making it years ago because the batter is so heavy it burnt out her mixer! My Kitchen Aid mixer should be able to handle it. Good thing there are no egg allergies in my family because the recipe calls for 7 eggs!